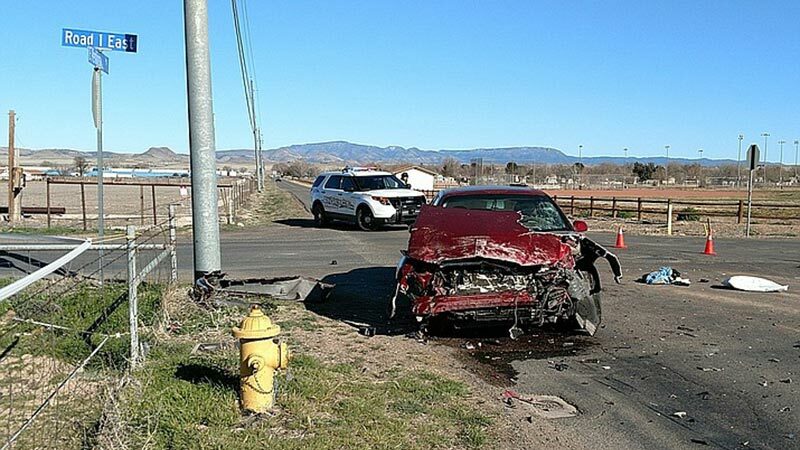 Chino Valley, Arizona—Ernest Nichols, age 92, sustained serious injuries after colliding with a pickup truck at the intersection of Perkinsville Road and Road 1 East. According to investigators with the Chino Valley Police Department, Mr. Nichols was driving southbound on Road 1 East and did not stop at the intersection. He crashed into the side of a Dodge pickup truck with an attached trailer, forcing the truck off a road and into the front yard of a residence. When police officers arrived, Mr. Nichols was in his car and unresponsive. Officers were forced to break a window to free him from the vehicle. He was taken by ambulance to Yavapai Regional Medical Center then air evac'd to Flagstaff Medical Center, where he remains in critical condition. The driver of the pickup truck also sustained injuries in the crash and was transported to Yavapai Regional Medical Center for evaluation. We wish complete and speedy recoveries to both people involved in this accident.